Operations and Maintenance: Vergnet S.A.
Canadian private investor (IPP), WINDWATT, developed, financed and operates Maddens Wind Farm, the first wind farm in the country and the first island of the CARILEC zone to reduce its energy dependency on fossil fuels, such as oil. By diversifying in renewable wind energy, Vergnet has delivered significant cost savings for WINDWATT who have drastically cut oil use and saved on the associated costs of the purchase, transport and storage of fossil fuels. The wind farm is composed of 8 Vergnet GEV MP-C wind turbines and over 200 of Vergnet’s wind turbines are installed in the neighbouring French West Indies, which allows each region to benefit from important synergies both in the settlement of wind farms and in the ongoing operations and maintenance of the wind turbines. Nevis island was historically highly dependent on fossil fuels, such as oil, for the production of energy and electricity. In a bid to reduce dependency on fossil fuels and to diversify the island’s energy mix with clean, renewable energy, WINDWATT invested in wind energy with Vergnet. The wind farm supplies 20% of the power needed on the island. Vergnet was chosen to deliver this project due to the innovative and robust design of our wind turbines, which have been designed with anticyclonic technology and rigorously tested for optimum performance in extreme weather conditions. With over 25 years’ experience in delivering projects within isolated environments with extreme climatic conditions and limited electricity infrastructure, Vergnet was able to adapt project specifications to meet the requirements of the Maddens site. For many island regions, the use of fossil fuels, such as oil, as an energy source can have a significant financial impact in terms of the purchase, transport and safe storage of fossil fuels. Often hampered by extreme climatic conditions or remoteness of location, many island regions can become reliant on fossil fuels as the mainstay power source. Since investing in a wind farm with VERGNET, WINDWATT has been able to maximise generating capacity and benefit from significant cost savings with renewable energy. Our anticyclonic technology and robust design, developed by a team of experts and rigorously tested for safety and optimal performance, has allowed the region to benefit from renewable, clean energy all year round and delivers a high return on investment for WINDWATT. Our electrical engineers (PowerCorp) came from Australia and our manufactures for the Wind turbines were French. This effort will be continued to be realized by the people of Nevis for years to come when they continue to receive clean, green and efficient and not to mention cheap energy. 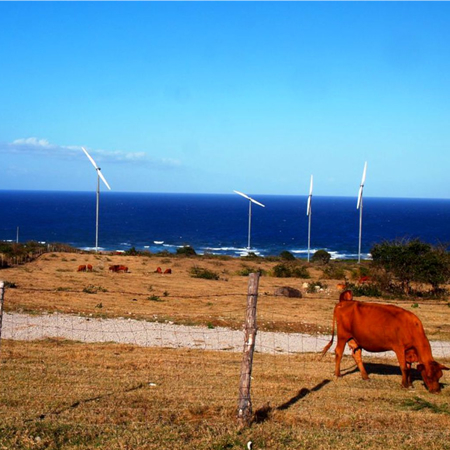 The Wind farm is just one step closer to Nevis becoming 100 percent reliant on green energy in the supply of electricity to the residents and businesses of Nevis.